Different anthropogenic activities result in the contamination and degradation of the agricultural ecosystem. Improper disposal of industrial waste, use of excess chemical fertilizers, and mining are major sources of soil contamination. These adverse conditions exert a negative effect on crop growth and yield, while a group of plants, known as halophytes, exhibit greater tolerance. These plants are native to such adverse environments and can withstand different abiotic stresses such as salinity, drought, toxic metal stress, and hypoxia. Halophytes grow luxuriantly in saline soils, which make them suitable for saline agriculture. In addition, they are a good source of salt-responsive genes and value-added products. Many halophytes show common biochemical and physiochemical responses to salt stress, whereas under multiple stresses, different mechanisms operate. 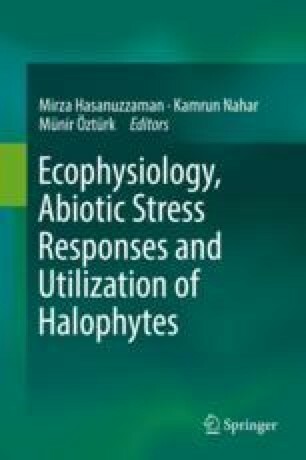 The accumulation of osmolytes such as proline, selectivity in K:N, the exclusion of sodium and vacuolar compartmentalization, the induction of antioxidant molecules (enzymatic and non-enzymatic) are the most common features of halophytic adaptation to stress. The comparative study of halophytes and glycophytes revealed that the former are well equipped with cross-tolerance mechanism and are well prepared before stress imposition. It is also reported that pretreatment/priming with salinity or other stresses in early developmental stage of halophytes improves their salt tolerance at later stage. This observation suggests that halophytes might have stress memory, which helps them to respond better to stress conditions. In this article, we present a current perspective of the general tolerance mechanism and the responses of halophytes to different abiotic stresses such as salt, drought, toxic metal, and combination of these. Understanding the mechanism of such abiotic stresses alone and in combination will help to identify potential halophytes for re-vegetation or possible breeding for redevelopment of salt-affected agricultural lands.